1. Our wall decor category provides high quality yet affordable canvas art. High definition picture photo prints on canvas with vivid color on thick high quality canvas to create the look and feel of the original nature and masterpiece. 2. The canvas print is already perfectly stretched on wooden frame for easy hanging . The side margins are also printed to create a particularly decorative effect. 3.Canvas Wall Art and Canvas paintings are the modern way to brighten the walls of your home, and relax you after work. It is sure to captivate wherever it is hung. 1.Haichuang Decor Art is one of the largest online suppliers for modern canvas wall Art,we can provide high quality wall painting, including oil paintings on canvas, acrylic paintings, Mixed-media paintings, Watercolor paintings, Drawings, Painting photography, Photo to portrait painting, Photo to canvas print, Canvas prints. 2. We feature a paintings gallery with thousandts of decorative oil paintings for sale and beautiful canvas prints from a multitude of periods and styles including modern art, contemporary art, abstract art, famous art, pop art and much more, to satisfy all of your fine art needs. 3.Every wall art use only the museum quality oil paints and canvas. As we continue to grow the new paintings and original art collection, whether you are looking for a famous paintings reproduction, such as Van Gogh paintings, Picasso paintings, Dali paintings, Monet paintings, Abstract paintings, Landscape painting, House oil paintings, hotel oil paintings, folk art or High definition oil pictures photo prints on canvas, you will find it at Haichuang Decor Art gallery. Wall art per set size:20inch x 40inch x 1pcs（50cm x 100cm x 1pcs),2cm Thick Frame. 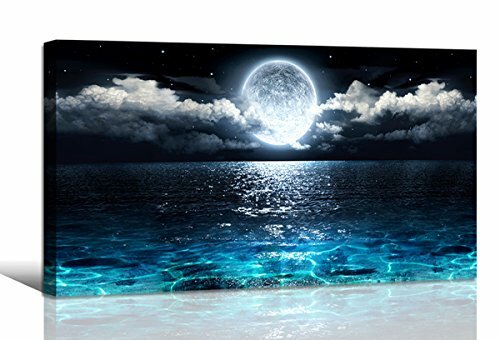 Wall Art Artworks Moon Sea Ocean Landscapepicture prints stretched and framed, canvas art printings ready to hang for home decorations wall decor. If you have any questions about this product by Haichuang Decor Art, contact us by completing and submitting the form below. If you are looking for a specif part number, please include it with your message.